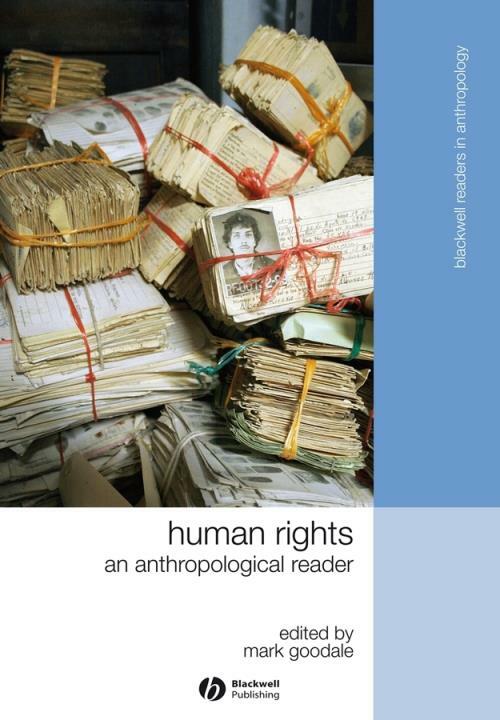 Human Rights: An Anthropological Reader is a groundbreaking collection that brings together key works that demonstrate the important and unique contributions that anthropologists have made to the understanding and practice of human rights over the last 60 years. For decades, anthropologists have drawn on a range of intellectual and methodological approaches in order to reveal both the ambiguities and tremendous potential of the postwar human rights project. This volume synthesizes these different approaches and demonstrates how anthropologists have engaged with human rights as committed activists, empirical researchers, and cultural critics. By examining and drawing out the broader implications of this continuing legacy for the twenty–first century, this text serves as an essential resource for researchers, practitioners, and students of human rights. Introduction Human Rights and Anthropology: Mark Goodale (George Mason University). Part I: Conceptual and Historical Foundations:. 1. Statement on Human Rights (1947) and commentaries: American Anthropological Association, Julian Steward (Late of University of Illinois at Urbana–Champaign), H. G. Barnett (Late of University of Oregon). 2. The Decline of the Nation–State and the End of the Rights of Man: Hannah Arendt. 3. The Good, The Bad, and the Intolerable: Minority Group Rights: Will Kymlicka (Queen s University, Canada). 4. Toward a Cross–Cultural Approach to Defining International Standards of Human Rights: Abdullahi Ahmed An Na im (Emory University). 5. Human Rights and Capabilities: Amartya Sen (Harvard University). Part II: Anthropology and Human Rights Activism:. 6. Declaration on Anthropology and Human Rights (1999): American Anthropological Association. 7. Anthropology, Human Rights, and Social Transformation: Ellen Messer (Brandeis University). 8. Excavations of the Heart: Healing Fragmented Communities: Victoria Sanford (City University of New York, Lehman College). 9. Rethinking Health and Human Rights: Time for a Paradigm Shift: Paul Farmer and Nicole Gastineau (both Harvard University). 10. Rotten Trade: Millennial Capitalism, Human Values, and Global Justice in Organs Trafficking: Nancy Scheper–Hughes (University of California, Berkeley). 11. Do Anthropologists Have an Ethical Obligation to Promote Human Rights? : Terence Turner (Cornell University), Laura Graham (University of Iowa), Carolyn Fluehr–Lobban (Rhode Island College), Jane Cowan (University of Sussex, UK). Part III: The Ethnography of Human Rights Practices:. 12. Representing Human Rights Violations: Social Contexts and Subjectivities: Richard. A. Wilson (University of Connecticut). 13. Gendered Intersections: Collective and Individual Rights in Indigenous Women s Experience: Shannon Speed (University of Texas, Austin). 14. Human Rights and Moral Panics: Listening to Popular Grievances: Harri Englund (University of Cambridge, UK). 15. Legal Transplants and Cultural Translation: Making Human Rights in the Vernacular: Sally Engle Merry (New York University). Part IV: Critical Anthropologies of Human Rights:. 16. Culture and Rights after Culture and Rights: Jane Cowan (University of Sussex, UK). 17. Human Rights as Cultural Practice: An Anthropological Critique: Ann–Belinda Preis (UNESCO, France). 18. Between Universalism and Relativism: A Critique of the UNESCO Concept of Culture: Thomas Hylland Eriksen (University of Oslo, Norway). 19. Toward a Critical Anthropology of Human Rights: Mark Goodale (George Mason University).